" Many pet parents have a cat and dog. 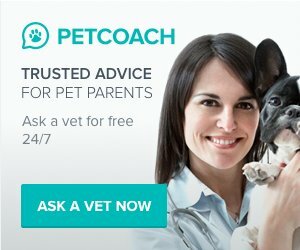 Whenever you bring two pets together there is always the potential for conflict, but most of the time the pros outweigh any potential problems. Most dogs and cats will coexist happily with many benefits. 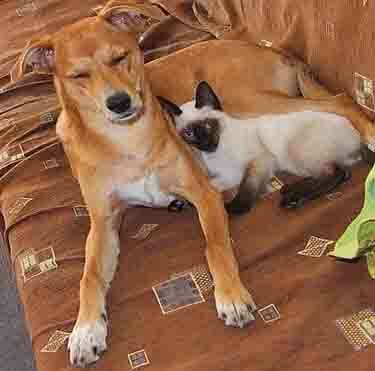 The dog and cat can provide each other with companionship. One pet can even look after and "train" the other for you on the rules of the house. There are behavioral differences to overcome since cats tend to be less social while dogs like to be social. It is also possible that a dog will chase a cat after being stimulated by the running motion., which is a perfectly natural behavior. An aggressive cat might even chase or fight with a more docile dog. Know that an aggressive cat always wins in a one-on-one battle with a dog, although an aggressive dog can kill a cat. Care and caution are always called for. In most cases there is no reason why a cat can't be introduced into a household with a dog, even if the dog has been living in the house for several years. The key to success is to make the introduction gradual as outlined below. Also be sure to create a safe place for the cat just in case. See a pet behaviorist if you are not able to make a successful introduction, if the cat chases the dog, or for cat and dog fighting. " Before introducing a dog to a cat it is important to assess each pet's personality to make sure they are good candidates for living together. In cats any aggressive behavior is usually defensive with the idea to diffuse a threat. Cats understand that if they fight or get hurt it can harm their ability to seek and get food. to avoid harm, a cat will vocalize to intimidate a threat and to hopefully avoid a fight. They will posture themselves to enhance the perceived size of their body, they will vocalize by growling hissing and yowling, and position the ears flat to the head. As a last resort a cat attacks dog problem occurs. If you see these behaviors it is best to remove the dog from the room as quickly as possible. It is important that the can not become conditioned to associate the dog with a fearful event (3) (see steps below for introducing a cat and dog). It is possible to test a dog around a cat, such as at a friends house. See how the dog reacts while on a leash. If the dog is wagging his or her tail then it is a good sign. Also if the cat appears nervous or defensive and the dog backs away, that is also a good sign. If the dog barks, whines or acts aggressively, then bringing a cat into the home may not be a good idea. It is not unusual to see both signs. The goal is to have some indication as to whether or not there will be a problem. Ultimately you may just have to toss a coin and hope for the best. For more information download this brochure on introducing a cat and go. Dogs and cats can get along. The key is to introduce the cat to the new home and the dog gradually so that there are no surprises for either pet. 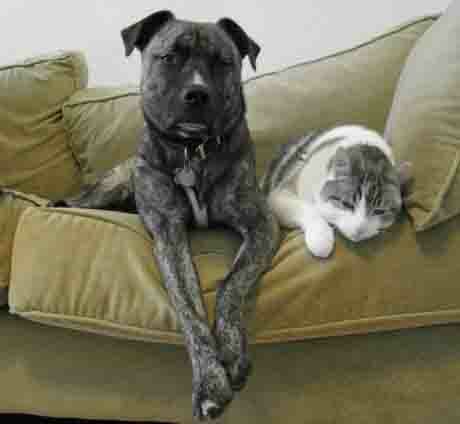 (1) When introduced corrected, a dog and cat can be close friends. The key is to negotiate the differences and desensitize the pets to each other so that the dog or cat doesn't feel out of balance. Remember, changes to a dog or cats schedule can create some discomfort. Keep the new cat in a room for 3 to 7 days away from the dog. Put the cat's litter box, water and food in the room. This will make the cat feel comfortable as he or she gets to know the surroundings and the smells of the home without feeling threatened. Next, place your dog outdoors and allow the cat to explore the house. If you cant' keep the dog outdoors, then use the dog's crate or keep the dog in an out of the way location on a leash. Next, the dog and cat should be placed into a situation where they can see each other but cannot touch. This can be done with a screen or glass door, or two baby gates. Keep them separated but within site 3 to 7 days. Feed them at the same time and within view of each other. This way they are each reassured that they will still be taken care of despite the presence of the other pet. Last, bring the two together, but be sure to keep the dog on a leash and have someone in the room who can keep the cat from lunging at the dog. Provide a treat to reward good behavior. A few short introductions are better than one long introduction. Do this with a friend or family member. Have the family member hold the dog on a leash and reinforce obedience training such as lie down and sit. The other person should then bring the cat into the opposite side of the room. Do not hold the cat. Put catnip, toys and treats in the room so the cat feels welcome and comfortable. Dogs learn by association. Make it seem like good things happen when the two pets are together. If a treat is your dog's favorite thing, provide it when the cat is in the room. Do not spend more time with the new pet than with the pet that was already in the household. If you do want to spend more time with a new arrival, do it out of view. Be sure to provide equal treatment between cat and dog. Set aside a few five minute petting sessions with the do and separately with the cat. To keep it private turn up the volume of a TV or radio so the pet doesn't really know what is going on by the sounds of you fawning over the new pet. Soon the dog will associate the cat as bringing benefits to the home. See a cat and dog behavior expert if you are not able to successfully make an introduction between two pets. An adult cat can stand up for itself when meeting a new dog. The opposite is true for a kitten. Never leave a kitten alone with a dog or puppy, particularly an energetic dog. Keep them separate until you see the pup mature. Dog's are attracted to litter boxes since they believe they will contain treats. This is a tough problem since covering the litter box is not always cat friendly (some cats will use them if they are frequently cleaned). Dogs can also getting into a covered box, particularly if it is a small dog. The best solution to a dog eating cat litter is to keep the dog away from the litter box. One solution is to get a barrier like a low baby gate that the cat can jump over, but the dog cannot. 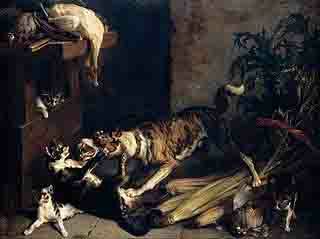 Some dogs will instinctively chase cats, although there is no ancestral rivalry between dog and cat. In nature they have separate hunting interests and domains. However, a dog and cat fight can occur if either animal is aggressive by nature. The rule of thumb as outlined above to use caution. Interestingly, cats that do not run from dogs often do not have a problem. Dogs are in it for the chase and will stop if a cat holds their ground and doesn't provide the motion that stimulates the chase. Cats can also be dangerous for dogs. A cat will nearly always win a one-on-one battle with a dog. 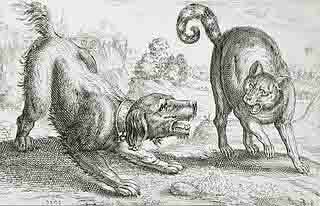 Once the cat jumps on the dog's back and flails out at his head and eyes with his claws, the dog doesn't have a chance. A cat will defend himself with his sharp teeth and long sharp retractable claws. This combined with a cat's speed and agility gives the edge to the cat. Dogs can get hurt, particularly if a claw harms the eye. Cats will rise up on his hind legs and swing out with what looks like fast punches. The reality is that most cats are not looking for a fight (except a mother protecting kittens, if this is the case keep the dog far away). If you see a dog and cat fighting the goal is to stop the aggression without getting hurt yourself. If you see any signs in the cat that a fight could begin say "no" and try and throw a magazine, keys or other object between them to try and disrupt the aggressive behavior (don't throw anything at either of the pets). Direct the "no" to the more aggressive pet to make it clear that the behavior is unacceptable. One approach to behavior modification is to use the steps above to re-introduce the dog to the cat. A cautionary step is to teach your dog to respond to a command such as to come in order to stop a chase. One neighbor owned a cat that had the bad habit of jumping on a big dogs' back digging his claws deeper and deeper until the dog got to the point where he had completely exhausted himself by aimlessly running around in circles. Then when the cat was done, he would leap off and retreat. Stopping the behavior took a garden hose and some water. When the cat approached the dog we would turn on the water in order to deter the cat. Worst case create places where the cat can escape or climb out of the way such as on a cat true. Spaces under furniture also make for good hiding places. Each pet in the house should have a separate food and water dish. The same goes for toys. The problem comes in when there is something that both want, such as a human bed. This might come down to making a choice regarding which pet stays on the bed and which has to leave. Of course, if you want both, this is a matter of choice. Most pets in the same household ultimately become friends, but others are completely incompatible. You could spend forever trying to work this one out, but unfortunately, the best solution is to keep each pet safe by removing one from the household by finding a good home. Before doing something radical, make sure you aren't the problem. First try not favoring one pet over the other. Stay calm and give the situation time to work itself out.